Chimichurri is a sauce from Argentina made with fresh herbs and typically served over grilled meat. Since the sauce is uncooked it’s not only a snap to make, but the perfect summer condiment. If you’ve been to an Argentinian steak house, you’ve likely had chimichurri. The classic recipe includes a good amount of raw garlic, which I never liked (before the FODMAP Diet, I would actually cook the garlic before adding it to the chimichurri). Luckily, the sauce is just as good sans garlic. In my opinion, it’s better. If you love garlic flavor, substitute garlic infused oil for 1 to 2 tablespoons of the olive oil. Looking for more low-FODMAP grilling recipes? Check out Lemon-Caper Fish and Veggies Grilled in Foil Packets and Caprese Salad with Grilled Eggplant! If you prefer sirloin or another cut of steak, go for it! The recipe calls for bone-in NY strip because that’s what I used, but boneless is great too. The sauce is also delicious on grilled pork, chicken, and fish. To use as a marinade, add extra olive oil and/or lime juice to thin. 1. Add parsley and mint to a food processor and blitz until finely chopped, scraping down bowl as needed. Add vinegar and lime juice. With processor running, slowly pour olive oil through the feed tube. 2. Add mustard, sugar and chile flakes if using. Season with salt and pepper. Pulse until blended. Consistency should be thick but pourable. Add additional oil or red wine vinegar to thin, depending on whether you like more or less acidity. Check seasoning. Can be used as a marinade, or served over grilled meat or fish. May be stored in the refrigerator up to 2 days. Serve at room temp. 3. Prepare a charcoal or gas grill (high for gas) and brush grate with oil. Season steaks with salt and pepper. Grill steaks over direct heat, turning once or twice, until done to your liking, 10 to 12 minutes for medium rare (130F to 135F). Rest at least 5 minutes. Slice and serve family style drizzled with chimichurri sauce. 1. Preheat oven to 400F. Line a large, rimmed baking sheet with foil (optional, to minimize clean up) and coat with cooking spray. Add potatoes and drizzle with oil. Season with salt and pepper and toss to coat. 2. Roast until potatoes are golden brown and very tender with pierced with a fork, tossing 2 times during cooking, 35 to 45 minutes. You've Gotta Pin This One! I love a good makeover (any What Not To Wear fans in here? ), but even more than the fashion and style stuff, I love a recipe makeover. Yup, for over 3 years I wrote a monthly column for Clean Eating magazine where I revamped classic recipes to make them healthy and (obviously) clean. I loved this gig. But just because a recipe’s healthy doesn’t mean it’s IBS-friendly. Lucky for you, making over your favorite foods into FODMAP recipes is NOT as hard as it seems. And you don’t need any ninja-chef skills to do it. Psst >>> If you want to start the FODMAP Diet but feel overwhelmed, I created a FREE email course to ease you into it and give you the tools you need to succeed. Click to sign up for the Free 7-Day FODMAP Jumpstart Challenge! It’s absolutely essential that you learn to make some of your favorite dishes low-FODMAP. Why? Because one of the biggest reasons people stumble in the first phase of the FODMAP Diet - the Elimination Phase - is the fear and sadness over giving up the food they love. In this post, I’m laying out the best tips, tricks, strategies and substitutions I know to develop crave-able, drool-worthy FODMAP recipes. It's the foundation of the Calm Belly Kitchen Cookbook. And it’s how I got myself through the FODMAP Diet with zero deprivation. This epic list of makeover strategies starts with simple swaps and progresses to mini recipes and creative flavor tactics. Before you dive in, watch the video to see some of my personal favorite recipe makeover strategies and substitutions (If you love Italian and Mexican food, it's a must-see.). Then read the post with YOUR favorite recipes in mind. If you remember one thing, make it this: Eating great food that you love is so do-able on the FODMAP Diet, and you’re not being sentenced to food prison without parole. 1) Replace Onion With Leek Tops: The green part is low-FODMAP, while the white part is high. Leeks have more flavor than onions, and you won’t cry when you cut them. Scallion tops are great too. The picture below show what part of the scallion or leek to use. Watch this video to learn how to wash leeks! 2) Replace Garlic With Garlic-Infused Oil: FODMAPs are water soluble, which means they soak out into liquids, but NOT fats. That’s why garlic oil is low-FODMAP. For the boldest flavor, add it at the end of the cooking process. 3) Build Flavor With Anchovies: At the start of the cooking process (when you’d normally sauté onion or garlic), sauté 1 tbsp anchovy paste or 2 to 3 oil-packed anchovies on medium heat in some olive oil. 5) Add Bacon: It's the time-honored method for making any recipe irresistible. 6) Replace Mushrooms With Eggplant: The texture is similar, and it’s great sautéed, roasted or grilled. 7) Buy Chile Powders With 1 Ingredient: Some products called “chile powder” are blends that often include onion and garlic, which are high-FODMAP. Instead make sure yours only contains chiles. Ancho chile powder is mild and incredibly flavorful. 8) Substitute lactose-free milk anywhere you’d use regular milk: This is real cow’s milk treated with an enzyme to remove the lactose so it works just like regular milk in recipes. 10) Replace Ketchup: Many commercial ketchups contains high-fructose corn syrup and occasionally honey (both high-FODMAP)...but you've got options. Instead of ketchup, toss your oven fries with lemon zest, chopped parsley and garlic-infused oil - delish! Use canned lentils to make refried beans - here’s my recipe! What low-FODMAP really looks like! Polenta Lasagna, Cobb Salad with Blue Cheese Dressing (both from CBK Cookbook) and Huevos Rancheros. > But wait! Massels brand is onion/garlic-free. Put all ingredients through vinegar in food processor and blitz. With processor on, slowly pour oil through feed tube. This marinade is great with just about anything, especially chicken and fish. Tip: A low-FODMAP serving of canned tomatoes is 1/2 cup. 16) Replace Pasta With Polenta or Risotto: There are some great gluten-free pastas out there too! My favorites are Jovial and Trader Joe’s brand. Tip: Make it a Ranch dressing by swapping the blue cheese for parmesan and adding fresh chives and/or scallions. Stir together all ingredients. Add extra milk if you want a thinner consistency. 20) Learn the Cheese Trick! 1) Check the ingredients: If added sugars or high-FOMDAP ingredients like honey or garlic (this is common in cheese products or flavored cheeses, not so much in natural cheese). If it’s got ingredients added, this trick doesn’t apply. Natural cheese DOES include things like: milk (or pasteurized milk), salt, cultures, enzymes, and possibly preservatives or natural colors. And that's a wrap! 20 cool, creative, delicious ways to makeover your favorite recipes. 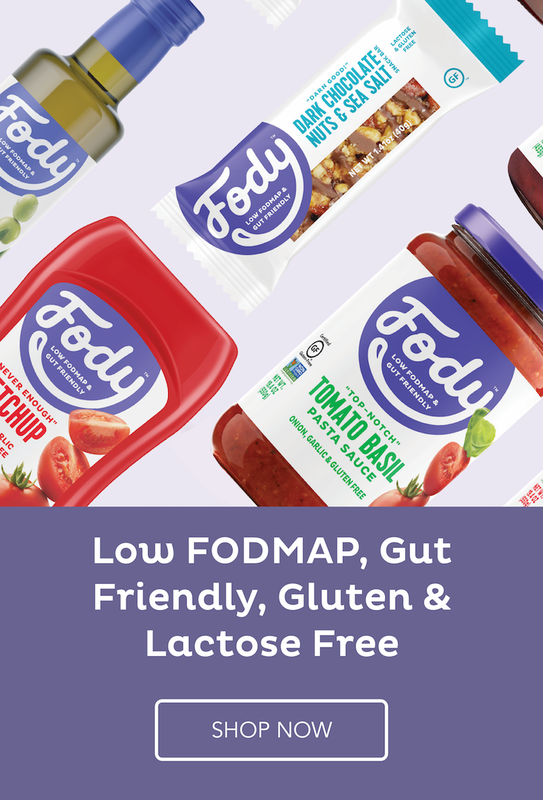 You don't have to give up everything yummy to do the FODMAP Diet, so don't let fear of missing out on great food hold you back from a calm belly. What recipes are you going to makeover? Have questions? Leave a comment and let me help!